← 2018 NWP Midwest Conference: Writing to Learn. Learning to Write. To grade rough drafts or not to grade them: that is the question I’ve wrestled with recently in my English teaching. Writing takes so much time to assess, especially when teaching the writing process and requesting that students revise multiple drafts of the same piece of writing. Moreover, I’ve learned over the years that students are more likely to take the writing process seriously if they are graded along the way. My own approach has been to grade first, second, and sometimes third drafts, and then record solely the final grade, but I know other teachers who opt to average the three (the better to keep students motivated in the early and middle stages of the drafting process). I began to confront this ongoing inner wrestling when I attended the National Writing Project Midwest Conference at the University of Wisconsin – Madison, August 3rd through 5th. Jen Doucette, from the Greater Madison Writing Project, presented a workshop on assessing student writing. She teaches creative writing classes and she has eliminated assessments on writing assignments – no points, no percentages, no grades. This approach to teaching writing seemed wonderful to me at first glance, but I realized there was a distinct difference between her assessment situation and mine. She teaches an elective course in creating writing while my writing instruction takes place in ELA core classes. However, I agreed with much of her rationale for eliminating grades on writing assignments. One of Doucette’s reasons for eliminating writing grades really struck a positive chord with me. She posited teacher’s values for writing progress being misaligned with an assessment rubric as a reason to jettison the rubric. 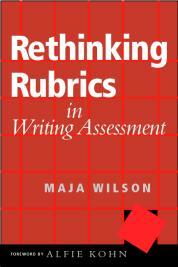 Doucette’s writing mentor is Maja Wilson’s text, Rethinking Rubrics in Writing Assessment. According to Wilson, “An assessment method must convince us that it reflects our values about teaching writing before it seduces us with its claim to save time” (28). 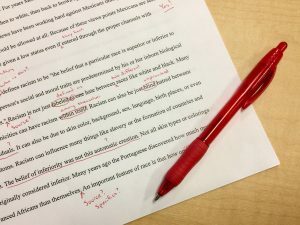 What do I value in student writing? I quickly scribbled a list that included the following: passion for a self-chosen topic, a clear voice that projected said passion, writing growth from first draft through final product, a nuanced understanding of the pros and cons of the topic, a well thought-out stance that included risk-taking in argument writing, solid supporting evidence, and an honest attempt to address and refute a counter-argument. Then I highlighted those areas I thought were most important. At the top of my list were passion about the topic, risk-taking, and writing growth. Then I thought about my assessment rubric. My most valued areas weren’t anywhere on the rubric! And, ironically, my rubric encouraged writing conformity, not the risk-taking I said I wanted. Yes, the grading rubric saved feedback time, but I really couldn’t justify its use when what I emphasized in class wasn’t being assessed. While I knew that I couldn’t totally eliminate writing assessments, could I only grade final drafts, while only giving feedback on revisions? I also wondered how my students would react to working on a rough draft but receiving feedback without a grade. Would they see this as an opportunity to take a writing risk, or as a chance to procrastinate or ignore the assignment altogether? Would eliminating grades allow more learning during the process? I determined to try it, to see if I liked it as much as I thought I would. Since I already knew that the vast majority of my students appreciate my use of essays rather than tests as summative assessments, I approached the subject of non-graded rough drafts with them confidently. I was surprised by their responses. They wrote to the rubric. They wrote for the grade. They didn’t like to revise. “One and done” was good enough. I realized that I needed to shift their mindset. I knew that talking to them about preparing for college writing was a moot point for many of them since college was not in their future plans. 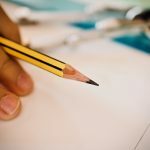 So, I completed some quick research on the amount of clear writing needed for different careers in which they were interested: law enforcement; medical technician; entrepreneurship (beekeeping, lawn mowing/snow plowing, Etsy artist); diesel mechanic; forest ranger; prison guard; organic farmer. I spent 10 minutes talking about career options that need writing skills, but then I spent 20 minutes discussing with them how good they would feel about their writing if they honed this life skill, and could pass it on to their children. The 20-minute discussion sold them, at least the juniors and seniors, and they promised to give “no grades on rough drafts” a try. On my end, I promised lots of written feedback on drafts via Google Docs, along with even more individual conferencing. The first assignment began in the third week of September. Students were reading The Hound of the Baskervilles, and the assignment was to use examples from Hound to support the rules of the murder mystery genre. For example, one “rule” of mysteries is that the criminal must be mentioned in the early part of the story, but must not be anyone whose thoughts the reader has been allowed to follow. Hound follows this rule because, while the criminal, Stapleton, is mentioned as a neighbor of the Baskervilles, there is no obvious motive, and Sherlock Holmes must first prove that the ghost hound is actually a living creature. Since we already had discussed the rules, and students had enthusiastically watched their choice of murder mystery on television and reported the results of the TV genre, from NCIS, Law and Order, and FBI, to TV classics such as Murder She Wrote, Bones and Elementary, they were ready to tackle the rules as found in the written texts. I supplied daily feedback by conferencing, and I spent a lovely September weekend in my sunroom writing feedback in the form of questions on their google docs rough drafts. Student response to my feedback was overwhelmingly positive. Since I didn’t need to worry about the grade, I could think more about the story and how it connected to the [genre] rules. Since there’s no grade for grammar or spelling, my thoughts could flow onto the paper easier. Your questions helped me to see my unclear writing spots easier. I think my introduction improved a lot and I felt like I could be more creative. Your individual time with me helped me organize my writing better. Since I couldn’t follow a rubric, I had to use my brains more, to think what I wanted to prove. Image courtesy of Pixabay user sweetlouise. Since this initial experiment at the beginning of the year, my students have written two more essays. At this point, I can report that my students have become comfortable with writing a rough draft that reveals their thinking, and that they plan to improve it as they revise it. This validates my purpose in eliminating grades on rough drafts. The students’ final products are more creative in word choice and content ideas, longer, and the students seem to be taking more pride in what they have written. And, all of them are revising more, and are willing to polish their writing more. Ended is the practice of “one and done.” I credit this change in mindset to a focus on the content and craft by the student, instead of a focus on the grade. And I am able to focus on teaching the writing practices that are most important to me: student passion about the topic, risk-taking, and writing growth. I’ve learned ‘tis nobler to focus on the feedback rather than the grade. 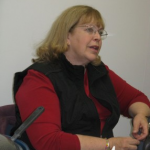 Deborah Meister is a high school language arts teacher at Fellowship Baptist Academy in Carson City, MI, and a Teacher Consultant at the Chippewa River Writing Project. She co-directed the CRWP Middle School Writing and Technology Camp for three summers at Central Michigan University with author Jeremy Hyler. She has presented on various writing topics with Dr. Liz Brockman, Kathy Kurtze and Janet Neyer at the NWP Midwest Conference, and the National Council of Teachers of English Conference. Her work has also been published in the Language Arts Journal of Michigan. This entry was posted in Reflections and tagged assessment, grading, Writing Instruction. Bookmark the permalink.